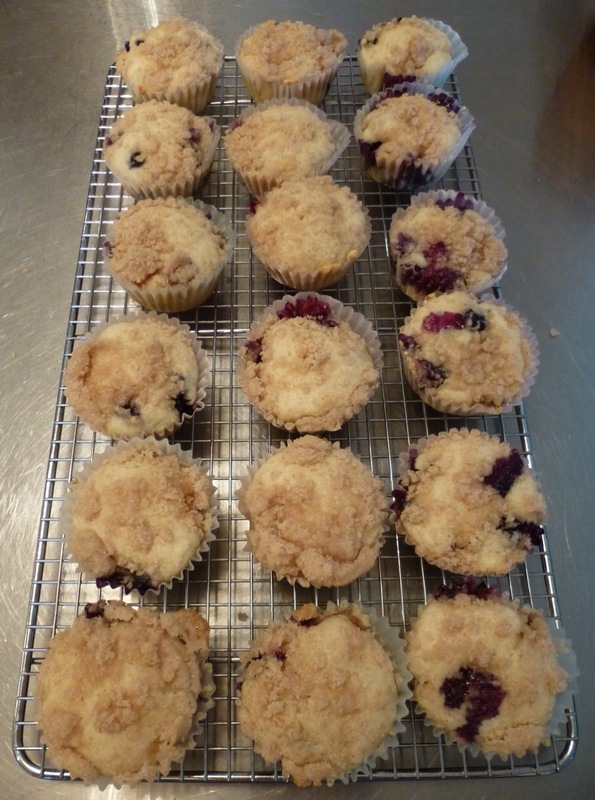 I have been making these blueberry muffins since I was a girl. The recipe came from my mother’s friend Pat in New Jersey. We make them all year long, but they taste best during the summer with fresh ripe blueberries. In a bowl combine sugar, flour, salt and cinnamon. Cut in butter to form crumbs. Chill until muffin batter is ready. Preheat oven to 350 degrees. Line 2 muffin pans with liners. You will get about 20 muffins from the batter. In a bowl whisk together melted butter and sugar. Add egg and vanilla and whisk until creamy, about 1 minute. In a separate bowl combine flour, baking powder, and salt. Add dry ingredients to the butter mixture alternately with milk. You may need a little extra milk. The batter should be thick but moist. Add zest if using. Fold in blueberries. Spoon batter into prepared muffin tins. You should fill muffin cups 2/3 full with batter. Sprinkle streusel over each muffin. Bake for 15 minutes. Let cool on rack. Makes 20 muffins. This entry was posted in Breads, Breakfast, Christmas, Fruit. Bookmark the permalink.